I do not give much thought to the change of seasons. Much of this is due to our weather. We can have a run of days where the temperatures are in the seventies in the middle of December and then snow the next day. Falling leaves could mean autumn, or that there was a hiccup in calculating and using defoliant on a nearby cotton field. However, I have read many posts written about the new season, and when I read Mim's request, I decided to think about my favorite sign of Spring. I no longer look for the first robin to announce that winter is leaving. Instead, I eagerly anticipate the blooming of the violets. I love this silly cartoon. I own the first season and will one day have the other three. I have yet to see Bender's Big Score, but hope to soon. I call it one of the most quotable cartoons ever, but when asked for an example, I say things like, "Once again, the conservative, sandwich-heavy portfolio pays off for the hungry investor." Ah, that is just another way I am weird. 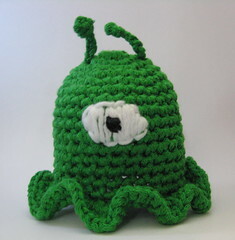 I crocheted this Brain Slug the other day. It is a semi-recurring alien from Futurama. It was quick to make. I can attach it to my head and wear it about, but I have not been brave enough to actually do it. I did try to place it on the head of a stray cat and take a picture. I am sure you can imagine my level of success. This past week has been full. We kept a nephew from Tuesday afternoon until Friday afternoon. Guess what? He is spending the night tonight here, too. We are not used to such excitement. Consequently, many things did not get done. I have not worked passed the hem on my EPS FIYC, I missed getting the garbage out to the street on Thursday, and I did not make it online much. It was fun, but I hope next week is quieter. Two new items made their way into my home this week. I look forward to getting to know them better. Somehow, the Zombies got my brains before I ever received the pattern. I am missing large chunks of last week. I am blaming it on Zombies and not worrying about the rest for now. You may be wondering why there is all of this Zombie talk. Last week, Sock Madness 2 began. If we had waited at home for five more minutes, I would have had the pattern as soon as it was delivered. Instead, I had it two hours after it arrived in my email inbox. I cast on and knit away. At first, I did not have any strong feelings about the pattern but soon enjoyed knitting it. It has such a wonderful rhythm. I liked the dropped stitches, and before I knew it, I was turning the heel. I motored on through without sleep. I missed a birthday party. No, it was not because of the knitting, but due to other bits of life jumping up and changing my schedule. I felt bad about missing the party. I just kept knitting. I caught little naps and continually refreshed the pool of pictures for the group over on flickr. I finally finished the socks in time to assist with a day of multi-vehicle maintenance. That kept us out until 2:30 Saturday morning. I caught up on a bit of sleep over the weekend. Now it is Monday, and there are still chances for many more knitters to make it to the next round. Although it is clear that I could have knit at a gentler pace, the frenzy of socknitting was good for me. Still, I am glad for the break until the next round. Time to cast on the body of the EPS FIYC. Several years ago, I participated in a research study. It took about two hours to drive to the facility, and then two more hours to drive home. It was a tiring process. I recall returning from one visit and sitting at a stoplight. I was probably fifteen minutes from home, and I was ready to be out of my car. I do not know whether the exhaustion was more mental or physical, but I certainly was done for the day. Brief bits of the medical appointment flitted through my brain. Anyway, as I waited for the light to turn green, I saw a large truck drive past. This is what was written on the side: EGG PRODUCTS. I tried to comprehend it. Among the things I had just been through were an EEG, and an EKG. I kept thinking, and remembered that an EKG is sometimes called an ECG. Then my mind finally cleared, and I had to laugh. Yep, I had been puzzled by the word egg. This brings me to my E entry in the ABC-Along. E is for Eggs. I look forward to filling these plastic eggs with candy, hiding them, and watching the kids find them. One day this week, my nephew and I will probably dye hard boiled eggs. I hope we have better success with the endeavor this year. The Nintendo Wii that my husband won arrived today. This is going to come in handy when we are watching the nephew for much of Spring Break next week. We have had fun with it today. My husband just laughs at me while he watches me play. I have not been able to convince him to give it a go. Anyway, this has been a great way to recover from yesterday, and prepare for tomorrow. I suppose that I ought to clear a path to my box of sock yarn. Sock Madness 2 is about to begin! While I was unable to get in as much spinning as I would have liked to during NaSpiMoMo and the Redux, I did spin some. After seeing the Stork's Nest Scarf by Nancy Bush in the Jan/Feb08 Piecework, I thought that my Shetland/Angora yarn could be nice match. I wondered whether I had enough yarn and what size scarf I would get, but did not fret a bit. After all, it is a scarf. I could always change the number of stitches in a row, the number of repeats knit, needle size, or frog it if nothing worked. Then I saw the SpinKnit idea slated for March, and I knew I wanted to try it. I was also ready to get some lace back on the needles. I have enjoyed the sweater knitting, but it is not laceknitting. This was a quick and easy knit. The charted pattern is a twelve-row repeat, but it is much simpler than that. Even after having memorized it, I still kept the chart by my side to mark the number of repeats I had knit. By the time I had knit the chart fifteen times, it was clear that I would not be knitting it the thirty-one times as written in the pattern. My handspun was a bit more substantial than laceweight, I bumped up a needle size, I never looked at the listed gauge, let alone check my gauge, so I was unsure of what scarf I would end up with when I finished knitting. I knit something like eighteen repeats plus the first eleven rows of the chart, and sweat my way through those six rows of garter stitch and the stretchy bind-off. I knit up every bit of my skein of yarn. I wondered about the length. Then it was blocking time. I was able to try for the first time my interlocking flooring squares and some checked cloth I had bought for blocking. After I pinned it all out, I tested out the ability to set the whole thing up on its side in the other room. It worked! After unpinning, I have a new 10"X60" scarf. I was going to give this to a friend, but I know she has some allergy troubles, and am unsure about how she would do with the fibers I used, but I really wanted to knit something for her. The length of the scarf ended my dilemma. It is too short for her. I will have to plan something else for her. Besides, the yarn I spun is not as soft as I would like, especially for a gift. Anyway, I have had the scarf done since Saturday, but did not get any pictures taken until today. We had a small adventure. The new car bug bit my husband, so we ended up driving to Atlanta to check out the Smart car. It was nifty, but I do not think we are getting a new car in the near future. It was a long day, but it meant something to him for us to make the trip, so that makes it worth it. I slept through much of the trip. It was more comfortable for my back to be reclined, and I just kept falling asleep. Besides, I was in the sun on the way down and not up for having a pile of wool on my lap, and it was dark on the way home. Speaking of, I am glad to be home. No, there is not some mysterious part of my past when I was mentally healthy. It is March, and I am getting excited about Sock Madness 2. I think that my desire to not be eliminated from the competition stems not from a need to win nor fear of losing, but rather a desire to remain in the fun frenzy. Yes, it is still fun from the bleachers, but being in the thick of it is great. This is such a great event that our two wonderful hostesses have organized. I know they put in a lot of work for us to have fun. What also impresses me is the great spirit of the competitors. When people talk about knitters being the best kind of people helping each other out, this is a great example. Speaking of the organizational talents of our hostesses, they pegged me perfectly when they placed me in my division. I am part of the Tennessee Twisted Knitters. Go ahead and laugh. I did. Ours was the last division posted, and I am glad to see that I am the only Skanky Knitter there. We have two Skanks over in the Baylor Ball Bands, and one in Maryland Merino Madness. The only division in which we are not represented is the UConn Cast Ons. Anyway, I have done almost no prep work for the competition. I have perused the supply list. I am relatively certain that I have all that I need to compete. I wonder about the laceweight round. I think that I am going to use some of the Bare Laceweight from Knit Picks for those socks. It is already in the stash, but just needs to be dyed. The sock needles are already naked and waiting. They should begin to itch about the time competition begins. Have I finished any sweaters lately? Did that stop me from casting on a new project? Do I feel bad about any of this? No, no, and not a bit. I waited for March to cast on for some SpinKnit lace. I took the hank of pink Shetland/Angora that I spun in January to the swift and wound up a nice cake of yarn. I had already made my working copy of the pattern, so I was ready to cast on. I am knitting the Stork's Nest Scarf from Piecework (Jan/Feb '08) by Nancy Bush. I made it through the first ten percent of the scarf before I could no longer remain upright. It is so good to have lace on the needles. Still, there has been some sweater progress. I went button shopping over the weekend. I think I may have the buttons for the TYC. I also felt compelled to purchase other buttons because I like the colors and they were on sale. That big wall of shiny color and the lights and the temporary price reductions, and the next thing you know, my cart had quite a selection. Anyway, I have been showing off the potential prospects to people to get their opinions. I have not made a decision, but I still have the button bands to work, so there is no need to rush, eh? Which buttons do you think are the best match? Maybe you think I need to continue the quest for different buttons. All opinions are welcome and appreciated. I am off to chase down the garbage can. I have a bag ready to place in it, so I need to secure it a bit better this time. Yes, I live a glamorous life.